from January 2015 to September 2015. Please help us! We are very low on funds. We do not have enough for stipends each month, and often, we are late in sending stipends. 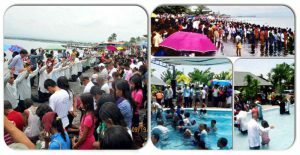 During the first 3 months of 2015, Southern Mindanao Mission baptized over 8,000 precious souls. To date, there are 13,179 baptisms in Southern Mindanao Mission alone. The 40 adopted ministers of Southern Mindanao Mission under Adopt a Minister International, the Gospel Outreach workers, mission workers and brethren of Southern Mindanao Mission work together doing evangelism. Twenty former adopted ministers are now employed in SMM. To God be the glory!